Part of my long Memorial Day weekend was spent in Los Angeles. Specifically Pasadena and the surrounding valleys. My Los Angeles-based born and bred friends have teased me long and hard about my infatuation with the valley area, specifically Burbank and Pasadena. 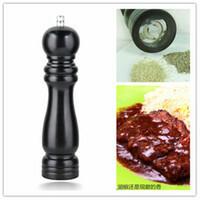 I could never really put a finger on why until now: it’s comfort. Sure, the rest of Los Angeles has Sunset Boulevard, Melrose Avenue and Beverly Hills but the Valley offers diversity and just seems more homespun and easier to drive around. When thinking about visiting Los Angeles, I think about spending that time in the Valley. One of those areas I found myself in this weekend was Pasadena. I could easily see myself buying a home in here. It’s relatively clean and seems to have a bustling restaurant night life on Colorado Avenue. Pasadena has two favorite places I love to visit: Crane Sushi (formally Shabu Squared) and Lucky Boy’s. I was saddened to hear that Shabu Squared had closed down sometime last year. Shabu Squared was easily one of the best places to have shabu. The prices were a deal and the meat was prime. It has been replaced with Crane Sushi now specializing in sushi but lucky for me, still serving shabu shabu. I don’t know how good the restaurant’s sushi is but the shabu shabu is almost as good as Shabu Squared. But for this Memorial Day weekend, it was a bit too hot for shabu shabu and the other option was Lucky Boy’s. Lucky Boy bacon lettuce tomato sandwich from 2006. Things haven’t changed much since my last visit to Lucky Boy’s. It’s still a greasy spoon open until early in the morning. Any sandwich with bacon is still overloaded with delicious pork strips. There is no stretching of the truth when I write that the bacon burger ordered fell apart in my hands on this visit. The bun could not contain the amount of bacon in the sandwich. A lot was learned from last visit and I split this sandwich. But the new find in Pasadena was Le Pain de Quotidien. If it wasn’t for Foodette’s comment about liege waffles, I would never have made a u-turn back to Colorado Avenue to check out their pastries. 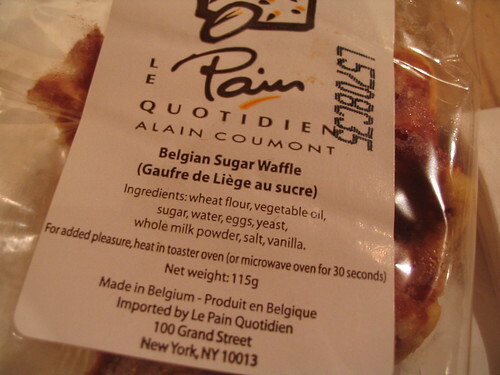 Le Pain de Quotidien has lovely, lovely sugar waffles. They come sealed and refrigerated. It was the perfect dessert post-bacon gorging. In addition, I couldn’t help but smile at the directions on the label: For added pleasure, heat in toaster oven. But I can’t justify the near $5 cost for one waffle. I can see two or even three dollars. But I’m prejudiced since I can make my own. The cost of convenience is so high sometimes. 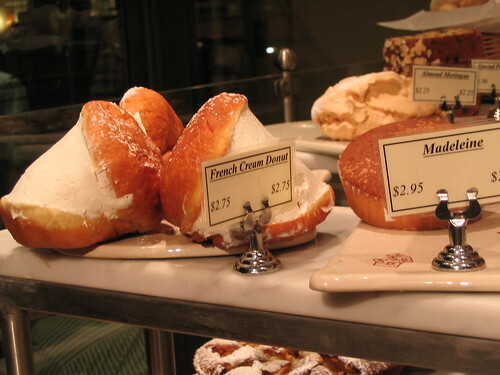 I also tried their French cream donut. It was cream only the only way the French could do it. Rich and decadent and — creamy. The donut portion was relatively plain in comparison to the filling. Even for two people, the donut was overwhelming. We should have heeded the warning from the person at the counter. The donut was dangerous stuff. OMG! That donut! I can't believe I've never seen that there! 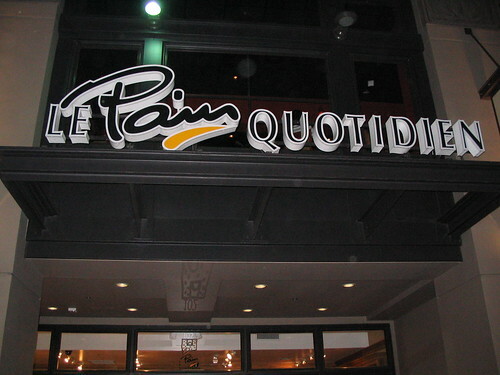 Hi Foodette–Thanks for the recommendation for Pain de Quotidien. The place was so cute. I want to go back and try everything else. I dropped by near closing so maybe that's why they only offered me the packaged waffle. I just noticed that the packaged waffle is imported too so that justifies the price but everything else seems reasonable.Hi Nanette–Yeah, isn't that donut incredible!?!? Seems like mostly French cuisine. Maybe a special treat after walking downing Colorado Blvd? Photogirl–Yeah, isn't that sandwich incredible?!? And it always comes like that. 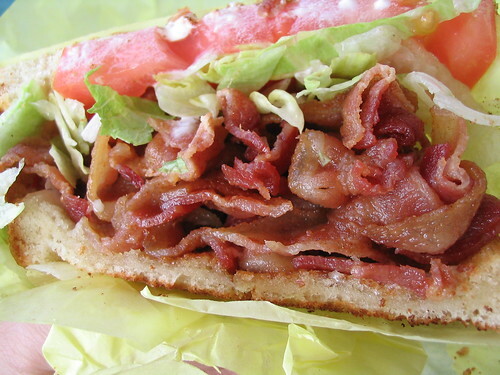 I read on a message board once that someone made the mistake of ordering a BLT with extra bacon. I could only imagine what that looked like! Hi Just Jenn–Ooo… next time I'll make it a point to try out their iced coffee. It will give me a reason to indulge and eat another waffle! And don't miss their Chocolate Bomb… Blast guaranteed! Hi Quentin–Oooo… chocolate bomb. It sounds like a guaranteed plus in my book for going back! Thanks.